After suffering a near fatal accident when a truck collided with my body in 2006, I went from feeling on top of the world, successful, and virtually indestructible, to feeling completely broken. I was completely broken. I was as broken as you can get without dying. All the helplessness that I had experienced during my childhood came flooding back to me as I was lying on the hot tarmac, fighting to breathe waiting for the ambulance. All my dreams had been shattered on impact. Even worse, the stakes were higher than ever, because we had just pulled out another full mortgage and scraped together our last pennies to renovate the Purple House. My kids depended on my earnings. Peter needed me as much as I needed him and I could see my whole little empire I had created over a life time crumble the same as my spinal structure and pelvis had. The first thing that saved my life was my love for Pete and the kids. The second thing was a ‘vision’. 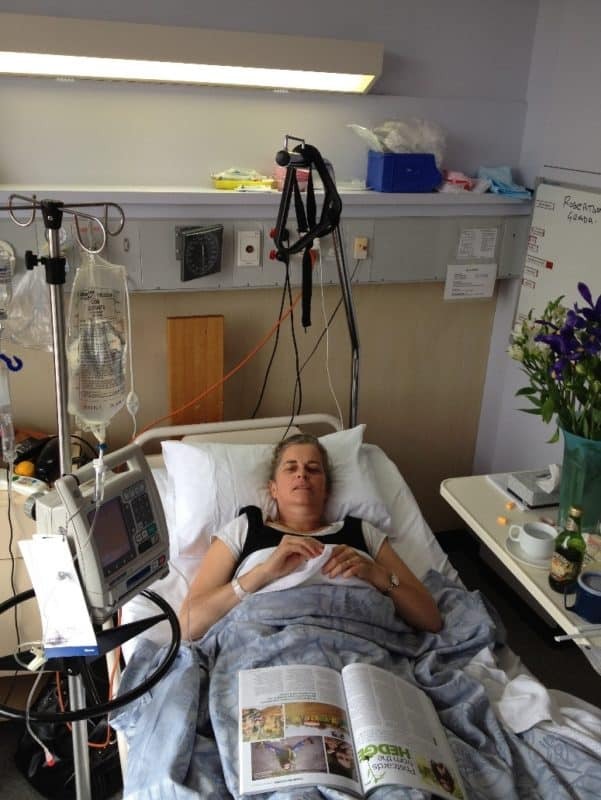 Yes, as I was carted into the ambulance I could see myself as an author, or coach or teacher. I could teach people how to become healers. I immediately latched onto this new dream with every ounce of imagination. It was bigger than all the misery I felt in my body. 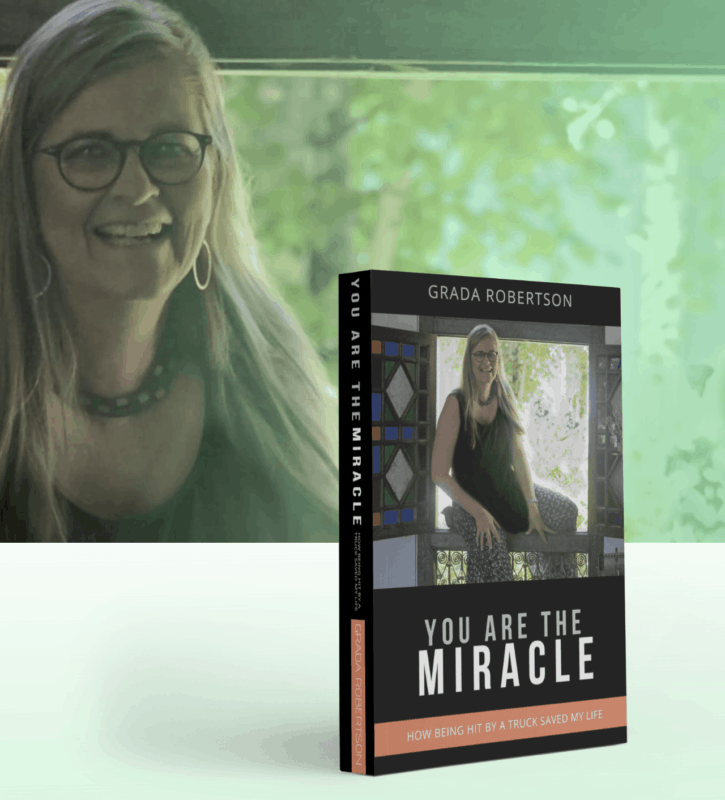 Check out Grada’s memoir by clicking on this picture! I wanted so badly to rebuild my life there and then. I made an incredible comeback. I recovered enough to start seeing clients again after 6 months. In that time I also started to do most of the housework while being mum of the kids again. I wanted so badly to be a strong person and not an invalid like my mum had been from age 45 to 74 (when she died). I wanted to be a fun mum and potential grandma, not somebody who drained everyone’s energy with complaints and stories about their misfortune. But every time I made a comeback, my body would rebel with excruciating pain. I had many stints in different hospitals all around the world, when I came to grief from overdoing it. My bowels would stop working and my mind also went on a holiday for periods of time. My mind was too broken to face the world at times. I had times that I was SO ashamed of my weakness. I simply didn’t leave my bedroom some days. I read books and cried bucket loads of tears. Other times I vomited from self loathing over my mental weakness. The inner tyrant had a field day. Of course I had many good days too. In fact most of the time, I was going good. But usually I had very little warning between feeling good and on top of the world, to free falling into a very black abyss of mental, physical and spiritual suffering. I would not only continue to suffer, but my suffering would eventually spill over onto my family. So I heavily researched everything I could get my hands on. I studied incessantly. I always used my body as my science lab. The most insidious lie I had to slay was the lie of not being enough. Of being weighed in the balance and found wanting. Where did that come from? The lies of not being ‘good enough or never being enough’ come from a lot of places. It is embedded in the consciousness of the planet. It comes from our parents, religion and society. It was one thing to know that I had a huge problem of never feeling good enough, and another huge project to heal it. I mean, I could see my own pain reflected in everyone else too. Do you know many humans who actually feel that they are enough? Who have boundless energy, who bubble over with joy, who have lots of fun? Not many I bet. I started discovering different techniques that I could use to hack into my nervous system and stop the emotional abuse I was inflicting on myself. I discovered ways to open the energy flow in my chakras. I learnt how to cleanse my energy field from destructive energy and feel lighter instantly. There were techniques for getting into flow/into joy, rather than stress and resistance. I learnt how to become emotionally very resilient. I learnt how to experience deep peace, no matter what my circumstances were. There was no umbrella term for all of these practices, learnings and treatments I gave to my clients. We simply called them Grada treatments. But ultimately, it didn’t matter what it was called. All I cared about was what worked and what didn’t, so I could help my clients heal faster than ever before and for all of us to have clarity about our lives and our relationships. Not only was I able to “recover” from my accident, I have become a better, wiser and more expanded version of myself. Then you absolutely need to know what I am going to offer in my Heal Your Life Mastery Program. The truth is, if you really want to Heal your Life you have to learn how to Master your Energetic body. Most human beings live in an energetic and emotional black hole. They go from one blunder to the next. Nobody teaches you that you are actually 99.9999 energy. That means you are a being of light mostly, rather than physical matter. At home and at school, you are only ever taught how to work with the material world, the reality as we perceive it with our eyes, ears and touch. There is a much better, easier and fun way: healing your life through the chakras. In this training we will work with 1 chakra each week and we are going to delete and uncreate all your limiting beliefs about yourself. They will be deleted across all time (so your offspring will benefit too) and across all space and realities so you experience peace, feel good enough and start brimming over with energy. We will delete lack and poverty, which most people are caught up in. We will delete sneaky punishment programs that hijack our nervous system. We will dissolve the Never Feeling Good Enough and other lies. You don’t need to control, manipulate or strive your way to the top! You will become successful in your own right. The practices you need to do for homework will help you stay in an expanded light filled state, so that happiness, health and success will become the new normal. Or talk to my team on 64283007. This entry was posted in Courses and Events, Grada's Blog. Bookmark the permalink.